The middle name of Edward Armon Thomas may have been derived from the surname of "John Armond," a soldier in the Revolutionary War. Born 20 Sep 1818 Nicholas County, Kentucky, U.S.A.
Died 8 Mar 1891 Montgomery County, Kentucky, U.S.A.
Edward Armon Thomas evidently lived during his last years in or near Haskell County, Kansas, but he was buried in Kentucky. (Perhaps he resided for a time in the Kansas Soldiers Home at Fort Dodge, KS.) He may have died while returning nearly 1000-miles to Mount Sterling, Montgomery County, Kentucky. Buried Machpelah Cemetery, Mount Sterling, Montgomery County, Kentucky U.S.A.
Born - 20 Sep 1818 - Nicholas County, Kentucky, U.S.A. Buried - - Machpelah Cemetery, Mount Sterling, Montgomery County, Kentucky U.S.A.
"Thomas, E.A., age 69 b. Nicholas, KY, farmer, Quarter Master Sgt 14th Kentucky Cavalry"
"Edward A. Thomas, of Mt. Sterling, KY; enlisted 20 Aug 1862 at Mt. Sterling, KY Quarter Master Sergeant, assigned 21 Aug 1862 to Co. D, Kentucky 14th Cavalry Regt; mustered out 16 Sep 1863 at Maysville, KY."
National Park Service Civil War Soldiers: "Edward A. Thomas, Co. D 14th Kentucky Calvary, Union; Quarter Master Sgt. in, Quarter Master Sgt. out." 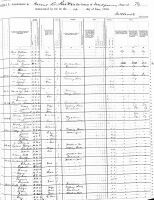 Kentucky Veterans Schedule, Nicholas County 1890: "Edward A. Thomas." Land Office Military Warrant No. 1863, John Armond, 100 A, 6 Nov 1783. U.S. Revolutionary War Rolls, 1775-1783: "John Armon, Private, 11th Virginia Regt., Sep 1777." Kentucky Tax Lists, 1799-1801: "John Armon, Bourbon County, 23 Jul 1800."